Who are the parties involved in import customs clearance formalities in Kuwait? What is the customs process in Kuwait to import? How is import cargo released from Kuwait Customs to importer? Import cargo clearance in Kuwait Customs. The information provided here details on how to import goods to Kuwait especially import customs clearance procedures in Kuwait. Customs clearance will be subject to declaration type, if Import, Temporary Import or in Transit, along with defined regulations of Harmonized Codes (eg. Prohibited and Restricted items). For Temporary Import of humanitarian goods, it is recommended to address this to the Customs Authorities ahead of goods arrival. Customs needed to import to KUWAIT. How can I clear customs to import in KUWAIT? What Customs formalities required to import in KUWAIT. 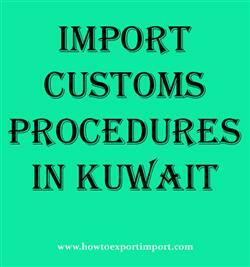 Import customs procedures required in KUWAIT. Import Customs process in KUWAIT. Process to import to KUWAIT. Requirements of customs to import to KUWAIT. Customs requirements in KUWAIT to import.